I don’t have any good cake decorating tips (sorry–I’m not good at decorating either), but I do have a photography question. What kind of camera do you use? You take the best photos and I want to learn how to take better pictures. Any recommendations? My mom was from the same mold as your mom re b-day cakes. The Wilton cakepan that looks like a girl in a bathing suit(seriously, I know it sounds creepy, but just go with it) makes a great strawberry. Just use a star tip and cover that thing with pink stars on the bottom and green stars for the stem and voila! an expert cake in the Wilton tradition. Michael’s likely has the pans. Good luck! Star tips are a cake decorators best friend. I took a couple of the Wilton classes at Michaels and got to where I am ok at decorating. I recommend taking a class if possible. I am terrible at getting smooth icing, so I typically do a lot of stars. P.S. I think simple is best when it comes to decorating. When I did cakes in the past, I’d use fake flowers or dodads or whatever I needed for effect. The best way to get a smooth cake..you need one of those flat metal spatula things. They are actually a cake tool. Dip it in a plate of milk and it will spread the frosting perfectly and just let it dry. I would do a round or rectangle cake and make a strawberry with a star tip. I have some great cakes from my girls birthdays, flamingo, poodle, and fairy’s, that I did. I love to do cakes they are fun. I have just read a few books and gotten help from, my mother in law. I have a problem with the writing. I can’t do it to save my life! If you need any tips let me know I can look it up in one of my boooks!!! …to smooth out frosting…sometimes i’ll use a blow dryer on low heat. or i’ll use it right after it’s mixed and into the fridge to set. no one likes to frost a cake with cold icing. yuck! The cake you made looks so cute! Good luck with making a strawberry cake. I remember my mom made me a strawberry shortcake cake, with the star tip. She also did my little pony one year, too. I don’t know how I’m going to live up to my mom’s amazing way of celebrating our birthdays. How about a yummy cake without frosting? It has a a bit of orange marmalade glaze and roasted almonds stuck to the glaze. It’s an olive oil cake…one layer and yummy and fast. I took it to a Primary party and it was the first dessert to go. Maybe not so much fun for children, but they still like to eat it. kristen – I think you’re right on with the star tip thing. that seems to be my mom’s trick much of the time. I need to practice practice practice! and, if you just read this post and have a great tip, keep it coming! Oh…and nancy, please do share that receipe! sounds delish! I’ve found that my best cakes use fondant–not to cover the cake (I haven’t mastered that yet), but just to decorate with. I’m not good with decorating tips, but I can use a cookie cutter to cut out fondant shapes and put them on a frosted 2 layer round cake. I did a blue frosted cake for Savannah’s second birthday with ocean animals and sea weed cut out of fondant in various colors, added a little brown sugar around the base for the sand and it turned out great! And not too difficult. The tips for smooth frosting are also good, but it helps when you cover up half the cake with the fondant. There are lots of websites out there with suggestions and help for working with frosting and fondant–and also with fun ideas for cakes. My mom had an awesome cake cookbook that had all sorts of fun cakes in it (bunnys, buses, footballs,etc), unfortunately it is out of print. However, the Kraft Food and Family website has a lot of good kids cakes recipes, some even have video instructions. Good luck! To get a cake fondant-like (without having to use fondant): Put your cake on a lazy susan (with parchment or a cake board under it, so you can move it off without having to ding it up), then, using a flat icing spatula (or any kinda knife or tool that doesn’t have contour), plop your icing on the top, then cover it all over, willy-nilly, on the sides and all. Then, spin and smooth your cake until you get it as smooth as you can – top first, then the sides. Though it takes like a hundred strokes, don’t get frustrated, just stop when you think it’s good enough. Finally, let it dry until it’s slightly crusty(8-10 min). Now take a big piece of parchment or waxed paper, and place it on the sides of the cake. Use your spatula to smooth that parchment across the surface of the cake. Do this on top too, and you’ll see that it takes care of the small crackly “stucco marks” that every cake seems to have. 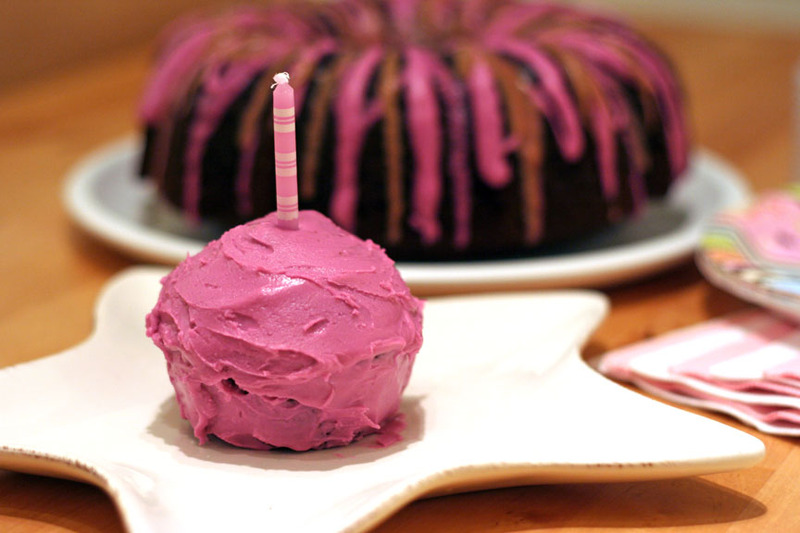 Buttercream frosting is never perfectly like fondant, but this comes really close! 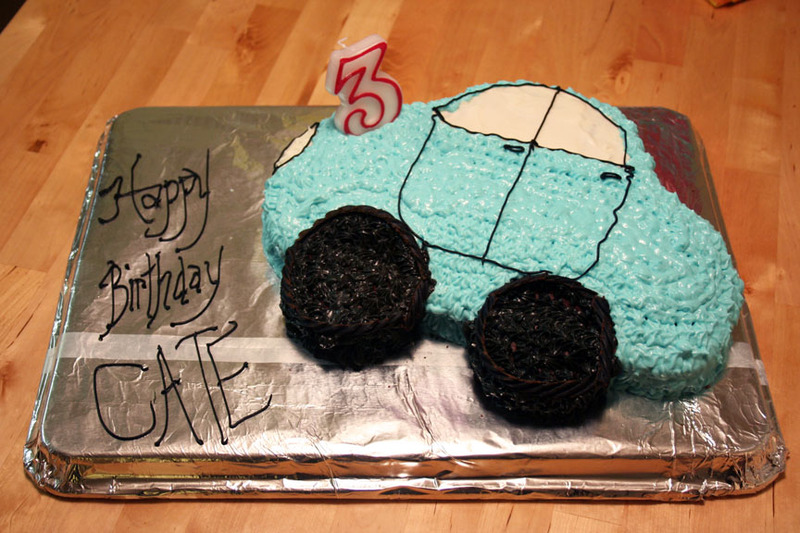 To make a cute cake: Make the design simple. Too many details equals too many opportunities to mess it up, and get frustrated. Make a cake, freeze it, then while still frozen, cut out the shape you’d like. I’ve even printed a template out on paper, and cut around it for my cake shape. Then, let it thaw (doesn’t take long), and ice it with a thin layer of whatever color icing. Next, using one of the darkest colors of your cake, outline the features on your cake. Finally, use a star tip and piping bag to fill in the outlines. As long as your icing is stiff enough, (and store bought icing usually isn’t – go to wilton.com for recipes) it will look great! If you have any specific questions, feel free to email me, I’d love to pay you and your readers back a little for the menu ideas that you’ve given me! I love the Wilton cake pans. They have great instructions and you can make a beautiful Cinderella, Care Bear, you name it. This Week for Dinner: Birthday Cakes Continued!